Engelbert Humperdinck, the Snake, and a Safe Pair of Hands! Within film, television and the media, A-Z Animals is known as “a safe pair of hands”. That is to say, when the animal project calls for expertise, safety and discernment, clients turn to A-Z Animals. This project is a good example of that. 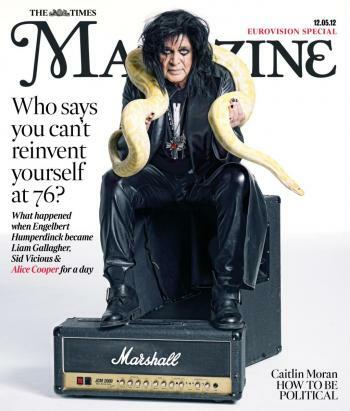 The Times wished to create a standout cover with Mr Humperdinck holding an eight foot snake, a la Alice Cooper. Needless to say, this is not something Mr Humperdinck does every day of the week! However, The Times, Mr Humperdinck and the Snake were in very safe hands. A-Z Animals provide and expertly supervise animals for filming, photography and special events.